In a previous article that was published in Residential Tech Today, I wrote about the Curb, Sense, and Smappee energy monitors. After writing about these new energy monitors, and the features they offered, I decided it was time to replace my ten year old energy monitor. For many people the Sense energy monitor will be easy to install. For me the installation was somewhat challenging. If your circuit breaker panel is mounted to a wall with the sides of the panel exposed and you have two unused circuit breakers then the installation should be relatively simple. Unfortunately, my panel was mounted between two studs of one wall in my garage, the garage walls are covered with drywall, and I didn’t have any spare circuit breakers in my panel. To overcome this I had to install two tandem breakers, route all the wiring for the Sense energy monitor outside of the panel, and mount the Sense inside a separate enclosure. So, instead of the installation taking under one-half hour it ended up taking me several hours. But, in the end the installation was clean and professional. With the physical installation done, I powered up the Sense. Using the Sense app I was quickly able to connect the Sense to my Wi-Fi network and start the 24 hour process where the sense checks the installation and begins to learn about the devices using energy in your home. I also found that after completing the installation process I had received an email from Sense with useful information to get me started. Using the Sense app, I configured the system to notify me whenever it discovered a new electrical device in my home. Less than two days after I powered on the Sense monitor it identified its first device, my furnace. At the same time it also started reporting the phantom power use in my home at 296 watts. Phantom power is the power used by always on devices, such as my smart home processor, smart light switches, cable box, etc. Given how automated my home is, and the number of always on devices it included in the automation system, I was happy with this as, according to the Sense app, the average phantom power among all Sense owners is 288 watts. One day later I was informed that my Sense had identified three more devices; my garage door opener, refrigerator, and refrigerator 2. I have both a refrigerator/freezer and a separate chest freezer. Unplugging my chest freezer for 2 hours allowed me to quickly resolve that refrigerator 2 was actually the chest freezer. I also received notification of another heater. This could be anything from my wife’s hair dryer to one of our countertop kitchen appliances. Again, after setting up notifications I was able to figure out that this was our toaster oven. These three devices are ones that I had, with my old energy monitor, created notifications to my wife and myself when they ended their cleaning/drying cycles. These notifications have been very useful as they kept us from, for example, forgetting we had a wet load of clean clothes in the clothes washer or ending up with pile of wrinkled clothes in the dryer. Unfortunately, there is nothing I can do to speed up the identification process. All I can do is try to be patient and setup reminders on our Alexa devices every time we use these appliances. After another two weeks I received a notification from Sense that two more devices had been found; “Washer” and “Heat 4”. I suspect that these are the washer and dryer that I have been waiting patiently for Sense to discover. To test this theory out, I’m going to take the drastic step of doing laundry. Sure enough the “Washer” is my clothes washer. The only downside of the way Sense is working with the washer is that as the washer transitions through cycles and there is time to, for example, refill the tub with water, Sense sends me a notification that the washer has turned off quickly followed by a notification that it has turned back on. A second weirdness is that the final notification that the washer turned off was several minutes before it finished its spin cycle. Sense’s custom notifications can be configured to handle this kind of delay but unfortunately, the triggers to IFTTT aren’t as flexible. Trying to compensate, in my automation system, for the dropouts in power usage during the washing cycle without delaying sending an end of cycle notification to my wife and I has proven to be challenging. Unfortunately, the new “Heat 4” device isn’t my dryer. So, I’ve turned on notifications for when this device turns on/off to help me figure out what it is. Another few weeks have passed and Sense has finally identified my dryer so my wife and I again have notifications to help us with our laundry, though I’m still trying to make the washer notifications more reliable and consistent. The time it takes for Sense to identify devices can be frustrating. Watching the user forum, this is the most common complaint about the product. I understand the complexity of what Sense is trying to accomplish but, like others, I wish they could find a way to speed up the process. Sense has a very active community forum and is very responsive in replying to user posts. For example, there was a very active discussion on Sense integration with SmartThings with various people debating what would be needed from this integration. With the large number of posts it is a wealth of information to help people troubleshoot problems and for new users to find out more about using the product. In my previous article I talked about the need for all manufacturers to leverage their communities to help people save energy. Sense has just announced Sense Saves; a new forum for people to share their stories on how they’ve saved money on their energy bills. It should be noted that Sense Saves isn’t designed to replace Sense’s community forum where there are discussions on device detection, feature requests, the ability to ask technical questions, and more. It is a much more targeted resource for people to share and learn about techniques to save energy. Sense Saves has only been active for a very short time but there are already a good collection of user written stories on topics including “Water heater savings,” “Vacation home electric way too high for years,” and “Sense identified bad furnace relay = $750 savings”; to name a few. The first thing that Sense made me more aware of was the baseline energy consumption of all the electronics in my home. My “always on” power consumption was 278 watts or about $120 per year. Yikes! The question is, what can I do about it? The first question is which of these devices shouldn’t be powered off under any circumstances. In addition, my stove and clothes dryer would be somewhat challenging to power off because they are both on high current 240v circuits. It would also be a pain to power off my microwave because I would have to reset the clock every time. This is the same situation for my water softener. Finally, while it is a known energy hog, I don’t want to power off my cable box because it is a DVR and I would certainly miss recording shows if it wasn’t on all the time. My next step was to investigate how much energy each of the remaining devices use in standby mode. A smart plug is going to use about 2 watts of power so you have to weigh this against the standby power use of each device to see whether it makes sense to use one to power the device off/on. Clearly there is little value to invest in a smart plug to completely remove power from any of these devices when they aren’t being used because they consume so little power when in standby mode. I could plug the TV, A/V Receiver, Roku, and Blu-Ray player (which are all located in a single cabinet) into a power strip that would be plugged into a smart outlet. But, this adds very little value because together they only consume less than 6w. After plugging them into a smart outlet I would save just over 3w; which would have a minimal impact on my electrical bill or the environment. As I purchase new appliances and electronic devices, or replace ones that have failed, I am going to be much more watchful of the power they consume while being used and in standby mode. To better understand phantom power I purchased two TP-Link HS110 voltage sensing, smart, plugs. I plugged all the hardware associated with my network into one. I then plugged the hardware associated with my A/V system and my home automation system into another. After using the Sense app to tell the Sense system that I had added these smart plugs to my system, it only took a few minutes for it start reporting the power being used by the devices plugged into the smart outlets in the Sense app; very impressive. I now know that my network hardware is using 50w and my A/V and Automation hardware (with the A/V system turned off/in standby) is using 74w. This accounts for almost half my “phantom” power. You can only enter a single value for the cost of electricity. Unfortunately, power companies have much more complex billing schemes. In my own case there are different rates for winter vs. summer and there are three tiers of rates depending on the amount of energy you consume. Because of this, any reporting that Sense does on the cost of your electricity is only a rough estimate and is not going to correspond with an actual bill.I would prefer that, like the Curb energy monitor, Sense would simply allow me to enter where I live, who my power provider is, and select my plan. Then Sense would use this information to provide a much more accurate calculation of the cost of the energy I’m using. 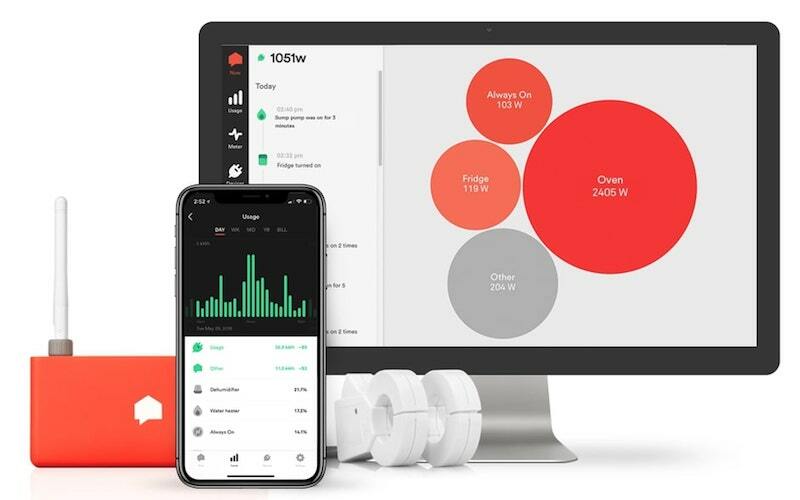 Once Sense moves to accurately representing the cost of electricity for their users they can take a big step and assist people in managing their energy usage. Sense, can use the knowledge of the cost of the users electricity (which may vary depending on the time of day), the cost of operating an appliance, solar production, and more to help a customer schedule energy using tasks so they minimize costs. For example, Sense could trigger, through IFTTT, a smart electric clothes dryer to run when it was cheapest for a user or send a notification to the user if their clothes dryer wasn’t smart. Sense is moving towards being able to predict when appliances may need to be replaced based on changes in their energy signatures. While that is a work in progress I wish that a homeowner could flag an appliance in the sense app for capture of power on/off cycling data. A homeowner could then, for example, go to the Sense app and graphically view how many times per day their refrigerator cycles on/off over time and see if it is trending to cycling more; which could mean it is about to have a problem or is simply getting old.In addition, it would be nice if an alert could be set if there is a sudden change in cycling compared to the average. This would be a great first step as Sense moves forward to develop their AI based, prediction software. Any goals and custom alerts should have a routing option so it can either generate an alert within the mobile app or be routed to IFTTT with a tag that would allow the IFTTT trigger to be passed to a 3rd party system for a unique action. Budgets are a valuable feature but electricity usage varies considerably by month depending on whether it is winter when the furnace is in heavy use, summer when the air conditioning is in heavy use or spring / fall when neither may be used. The homeowner should be able to setup a budget schedule that includes unique values for each month. Without the ability to set a budget by month, I find the budgeting feature of Sense to not be of tremendous value. And, this really limits Sense’s value as a tool to help people focus on their electricity usage on an ongoing basis. Sense has made it clear, through posts on their blog, that they don’t feel that being able to manually train Sense to detect a specific device is practical. However, this is a feature of the Smappee energy monitor that operates similarly to Sense. Just because it is hard doesn’t mean Sense shouldn’t do this as they are currently operating at a competitive disadvantage to the Smappee. Any step Sense can take to allow people to participate in the identification of energy using devices in their home would be a big help to reduce the number one frustration people voice about the product in the community forum. Sense has incorporated smart, energy measuring, outlets such as the TP-Link HS110 into their ecosystem. The whole process of incorporating these into the Sense energy monitoring ecosystem works seamlessly. However, to measure the energy used by specific devices and appliances users, including myself, are putting these in places where they would never want to have power interrupted by the outlet turning off. This includes refrigerators, freezers, and in my own system, networking and home automation hardware. It would be nice if Sense supported an auto-on feature where the devices settings could be set to automatically turn the outlet back on if, for any reason, it is turned off. I believe Sense needs a better way to monitor devices, like my clothes washer, that have cycles of operation that the Sense monitor thinks is the device turning on/off several times. It would be very helpful if the user could tell sense to merge these segments of operation together into a single cycle. Sense could then learn to recognize the pattern of operation (my clothes washer always ends with a high speed spin) and not trigger that the device is off until the full cycle of operation ends.I am told by the people at Sense that they have recently made improvements in this area. However, the gaps in power usage by my washer are still triggering multiple notifications that it is done with its cycle so there is still more work to be done. It is good to know that Sense recognizes this as an issue and is working to improve their detection of these types of devices. I don’t believe that Sense’s identification of devices by their power signature technology will ever be perfect. For 120 volt devices the integration of energy sensing smart plugs is a great solution. There needs to be similar solution for 240 volt devices; even if Sense has to build it and offer it as an accessory to the energy monitor. This would solve the issues with trying to detect car charging systems; which seem to be problematic based on the community forum threads on this topic.Even better would be an add-on IP based device that would allow a collection of current sensors to be added to Sense that would allow a homeowner to detect usage on a series of circuits that might otherwise not be detected by Sense. For example, Sense continues to have trouble identifying my dish washer and this would solve that issue for me. It would also be a solution for detecting car charging systems as described above. Overall, I really like Sense. It has made me more aware of how power is used in my home. But, Sense still is, in many ways, an emerging product. The company is working all the time to improve Sense’s capability and accuracy in applying energy signatures to devices in a home. I believe that, over time, the product will get better, and better; offering more features and improved accuracy to its users.